This ad takes place in a bar and mimics the old “Tastes Great, Less Filling” Miller beer commercials. It’s another in a series of ads in which Republican challenger Pete Hoekstra labels Democrat Stabenow as the “worst senator ever” without comparing her record to that of any other Michigan senator. One bar patron holds up a sign that says “196,587 more Michiganders unemployed.” The number is correct, as measured by the Local Area Unemployment Statistics series. Another bar patron holds up a sign that says, "Debbie Stabenow voted to raise taxes 150 times. Against reducing the marriage tax. Against doubling the per child tax credit. To raise taxes on Michigan small business." Viewers aren’t provided with sources for any of these statements. They are instead directed to a website, worstsenator.com, which also provides no background material for any of the claims made in the ad. The Hoekstra campaign did respond to an inquiry from the Truth Squad with a list of votes they used to get to the 150 total. But in 2012, she voted to extend the Bush-era 2001 and 2003 tax cuts for households with incomes of under $250,000. No examples of wasteful spending are cited in the ad. The bartender casts doubt on the call, pointing out that the official is just a replacement ref. Overall impression: This ad has some accurate claims. For example, there are nearly 200,000 moreMichiganresidents counted as unemployed than there were at the start of Stabenow’s Senate tenure in 2001. And it’s a stretch to place the blame solely on the shoulders of a U.S.senator, as Hoekstra tries to do. Many others played a role. A Republican president led the country for eight of the nearly 12 years Stabenow has been in the Senate. AndMichigan’s decade-long economic decline started in the final two years of Republican Gov. John Engler’s tenure in office. 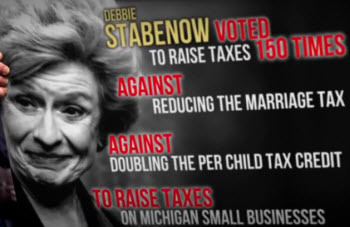 Stabenow voted against the 2001 tax cuts. She voted earlier this year to extend those tax cuts for “middle-class” taxpayers. Hoekstra’s claim that Stabenow is the worst Michigan senator ever is just meaningless name-calling. Foul or no foul: Flagrant foul.“Worst senator?” “Wasteful spending?” If you are going to use hyperbolic claims, you had better offer data to support the case. The Hoekstra camp with this ad is asking the viewer/voter to take the assertions at face value. Hoekstra also fails to explain how a single U.S. senator is personally responsible for the economic results of an entire state over an entire decade. Most seriously, the “voted to raise taxes 150 times” claim ignores and contradicts the very source material on which the claim is based. Stabenow was tagged with the dubious award in March for sponsoring a failed amendment that would have extended federal subsidies for green energy. But the organization tends to criticize lawmakers for their votes in favor of programs, such as support for alternative energy, it doesn’t like. Stabenow is the sponsor of the Agriculture Reform, Food and Jobs Act of 2012, known as the farm bill. It’s a reauthorization of the 2008 farm bill that expired at the end of September. The Senate passed the bill, but the House has yet to vote on it. The particular numbers mentioned in the ad are correct. The 1,010-page bill, which would spend $969 billion over 10 years on agriculture-related programs, has been criticized by some lawmakers for what they call pork barrel spending to benefit certain segment of the agriculture industry, such as crop and sheep farmers, and popcorn producers. Others say the programs are needed as part of a research and marketing effort to help U.S. agriculture industry compete with other countries. The farm bill would require the Department of Agriculture to remove geese from a wildlife preserve near John F. Kennedy International Airport. The provision was added by Democratic New York Sen. Kirsten Gillibrand, who said geese removal is needed to reduce bird strikes of airplanes flying in and out of the airport. A second Michigan GOP ad shows Stabenow being asked at an event why it was necessary to include money for a sheep production and marketing program in the farm bill. The ad incorrectly states that the program will cost $15 million. It’s $1.5 million. Stabenow says she can’t recall which of her colleagues pushed for the sheep program provision. An aide tells her it was Democratic Sen. Max Baucus of Montana. Overall impression: Providing government payments and other assistance to farmers has long been controversial. Stabenow is at the forefront of that controversy as the sponsor of a farm bill that would spend nearly $1 billion over 10 years. The two ads produced by the Michigan GOP highlight relatively minor parts of the voluminous bill. And the “Sheepish” ad incorrectly states the cost of the sheep program as $15 million. That ad also criticizes Stabenow for not being able to remember why the sheep program is important. It might be asking too much of an elected official to instantly recall every part of a 1,010-page bill, but the ad does raise a legitimate issue: Is there too much spending in the farm bill? Stabenow has repeatedly pointed out that the bill cuts $23.6 billion in spending from the previous bill, a point that even farm bill critic Sen. John McCain of Arizona concedes. The “Addicted to Spending” ad, in stating that Stabenow is pushing the farm bill at a time when “families and farmers are cutting their budgets,” seems to suggest that farmers oppose the bill. However, the Michigan Farm Bureau has endorsed Stabenow for re-election. The Farm Bureau represents more than 200,000 farm family members in the state. Foul or no foul: Technical foul. The state party got a bit sloppy with its $1.5 million vs. $15 million claim on the sheep, but since the party had it right in one ad, this does not appear to be part of a strategy to mislead. The ads are right on Stabenow’s “award” and on the farm bill numbers and on the video in which she doesn’t immediately recall the particulars of a program within the bill. But the ads don’t detail what constitutes “pork.” Michigan may not care about bird strikes at JFK, but New Yorkers may have a keen interest in preventing them – even to the point of using federal dollars. That’s the nature of writing big funding bills in Washington – the value of the spending varies from observer to observer. The Repugs are playing fast and loose this election with outrageous ads and ridiculous claims across the board, many of which resulted directly from the Engler and Bush administrations. Engler left this state in a horrible economic mess at a time when the American auto industry was slipping fast, leaving Granholm unable to stop the slide. Bush left us with 2 unpaid wars and a Wall St. bubble in process of bursting.